Originally conceived by Simon Jeffes (when delirious with illness from a dodgy fish dish) in 1972 as a utopian locale for dystopian chaparral, over five albums Penguin Café Orchestra proffered sunlit serenades and optimistic orations (of the mime kind) designed to enliven and illuminate in a uniquely pastoral British (to the) manner (born). Combining avant garde tropes with ambient notes (originally signed to Brian Eno’s Obscure Records) the band’s first live performance was supporting Kraftwerk at London’s Roundhouse in 1976. The versatile Jeffes also helped with the string arrangement on Sid Vicious’s ‘My Way’ in 1979 and introduced the Burundi drumbeat to Adam and the Ants with the arterati ultimately anointing them with a South Bank Show special in 1987. The group’s evergreen music continues to proliferate from advertising to film soundtracks, sampled sources to theme tunes. 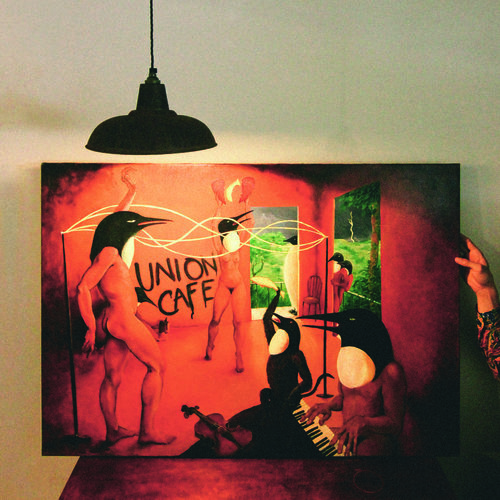 Union Cafe was the fifth and last studio album by Penguin Cafe Orchestra in 1993 and the Erased Tapes label are releasing it on vinyl for the first time. In these bleak times these intricate and intimate chimes resonate ever so greatly. The jaunty jiggery of ‘Scherzo and Trio’ (also the theme tune to Radio 4’s Round Britain Quiz) evokes Dexys Midnight Runners and Glenn Miller, the result a heady concoction of mood swinging and too rye aying: a frank sonata. There’s oboe-showboating at its most mournful on ‘Lifeboat (Lovers Rock)’ before it cascades into finger-pickin’ happy-sadness redolent of Ennio Morricone’s spaghetti western work. ‘Another One from Porlock’ is purloined from Samuel Coleridge’s unwelcome visitor when trying to write Kubla Khan, said intruder’s presence delaying its completion by 19 years. Inspiration comes in mysterious ways … eventually. ‘Discover America’ is an arch commentary on the Land of the Free (© Madison Avenue) interspersing traditional melodies with Johnny and The Hurricanes’ ‘Red River Rock’ in a prime example of sonic snarkytechture. The experimental ‘Passing Through’ is the found sounds of water dripping from a tap; mesmerising in its repetition the experience is a metaphorical realisation of the fleetingness of existence. The plughole awaits us all. Erased Tapes’ Robert Raths has said of this album ‘this release is righting an old wrong. The slow development of the pieces means that you can really get lost’. In these hypnoreal and hyper-accelerated times this album is an aural antidote, a calm betwixt the storm. Sixteen meditative ruminations/ruminative meditations for the bucolic-melancholic in your life. That’s YOU. Since Jeffes’ passing in 1997 his son, Arthur, has carried the mantle, converting to Penguin Café but no less orchestral.